People are busy—make sure the first paragraph is the best in the newsletter because some readers may not make it past there. Instead of starting with a rambling introduction, start out with a strong statement that pulls readers in. And it goes without saying: a strong subject line is required to get your readers to open your email in the first place. Short sentences are powerful. They can pack a punch and grab attention. Readers are bombarded by loads of information all day. People have short attention spans; get to your point quickly before they move on. Short sentences and short paragraphs make your statements easy to understand and easy to remember. Nobody wants to open their inbox to a 30-paragraph wall of text. Break up your content to make it easy for readers to skim and jump to the topics that interest them. Use headings, photos, graphics and dividers to help break up your text into pieces that are easy to skim and digest. But… as tempting as a bulleted list may be, they don’t translate well across all email browsers so our suggestion is to avoid them all together. Include a clear call to action (CTA) so your readers can take action easily, even if they are just skimming. Make the CTA stand out visually. It should be graphically different (buttons work well), and not be crowded in with other content. The CTA should be easy to understand what will happen when they click. For example, if you are providing a resource to download, which makes more sense, “Download now” or “Begin journey”? Before sitting down to write your newsletter think about the voice you will use. For example, you may use a very casual, fun tone if you are an ice cream company announcing a new flavor in your newsletter, where a bio-engineering lab announcing new research findings would not want to use that same tone. As mobile increasingly dominates how we access and read email, all of these guidelines become even more important. To begin, make sure your design is built using responsive techniques (not just mobile friendly) so it will look good on everything from large desktop monitors and small phones. Then realize that people are scanning their email more quickly and in a more distracted way when using their phones. 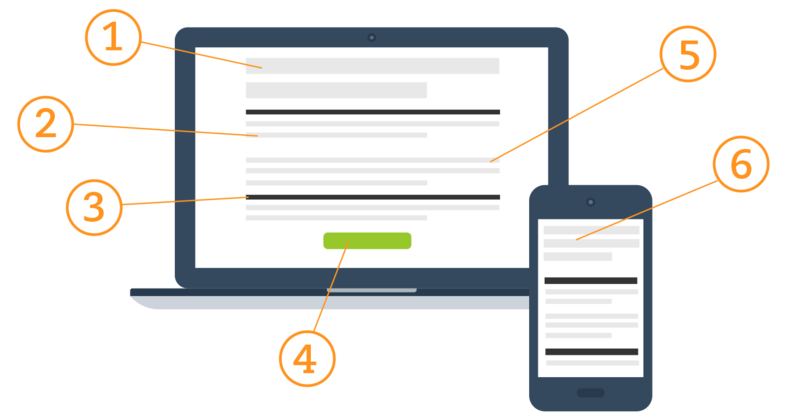 The ability to quickly scan, clearly understand and then easily act are even more acute when reading your newsletter on a mobile device. Struggling to write your newsletter? If you are having trouble generating content that gets your readers engaged, or just can’t find the time to get it done, Mail on the Mark can do it for you. Get started.